No need to run the risk of a bad case of the trots from bad water supplies – zap the bugs with UV light and safely sip away. Drinking water from a gushing mountain stream might seem tempting but finding a dead sheep further up the trail will signal the onrush of liquid bowel movements. Camping in the wilds, trekking in the tropics or just making sure that the water from a foreign tap isn’t going to ruin your holiday are all times you need a SteriPen. 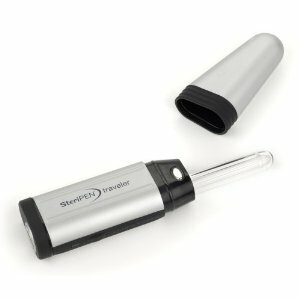 The SteriPen is about the size of a small torch and looks a bit like a hand-held lighter for gas hobs. The concept is simple. Zap bacteria, protozoa and viruses with enough UV-C light and it disrupts their DNA, stopping them from reproducing. This means that they can’t disrupt your digestive system either. The SteriPen couldn’t be easier to use. Push the start button and place the glass wand into a one-litre container of water so that the sensors are covered. The wand will then emit Ultra Violet and visible light; stir the wand around until the light goes out. If the small indicator light goes green, glug away, if it goes red, don’t: repeat the process until it is safe. There are no chemicals, just UV light, so there is no nasty after taste that comes from chemical purifiers. That’s not to say that if you have just purified pond water it might not have a strange flavour, but if your source is good it won’t be tainted. Safe but not sieved Even though this will produce pure drinking water from even the most contaminated sources, it will not filter out sediment. In many cases you will also need some form of filtration device, there are several types on the market, or at the very least, rig up a simple sieve by pouring the water through your shirt. Water should be filtered before using the SteriPen. The SteriPen is relatively robust, but when you might be relying on it to save you life, or at least save you from the shits, the last thing you want to do is break the glass wand. It is also an electronic device so needs batteries, not always readily available in the back of beyond. So to make it even more versatile there is a separately sold, small solar unit that will power it up if your batteries go flat. UV light can cause skin and eye damage but used as directed the SteriPen should pose no risks. Safe, effective and simple solution to scary water supplies, although it won’t sieve out the lumpy bits.